Hello! A few days ago, I arrived in Philadelphia to finish up my last semester at Philadelphia University. It's wild to think that this'll be my last semester here, as I graduate in May, but I'm excited to knock this semester out of the park and move on to bigger and better things as soon as I graduate. Like last semester, I'm taking a course overload for a total of seven classes in addition to a gym credit. I'm also still writing for this blog, The Odyssey and Explore Philly as well as tackling an internship with College Fashionista. I'll also still be working at my school for a few hours a week. I have a feeling that this semester will be another one bustling with activity but I'm looking forward to it. What I'm not looking forward to is the windy, freezing cold weather that will consume Philadelphia for the next few weeks. While I was in Richmond, the winter weather was mild and I didn't have to worry about layering and layering to stay cozy nor did I wake up listening to the wind whistle outside my window. I mean hey, when I arrived in Philadelphia there was even a scattering of snow on the ground. And I'm definitely not ready for that. For this look, I donned my furry leopard print coat to combat the cold. 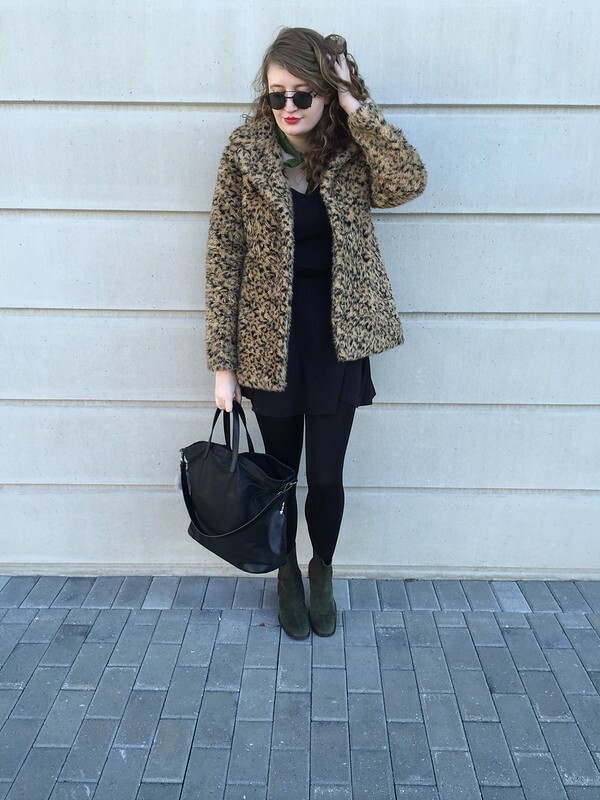 I wanted to let the coat shine so I paired it with a basic, black tee, black circle skirt and black opaque tights. I added a slight pop of color by donning a pair of vintage DKNY, dark green Chelsea booties and an olive-colored bandana worn as a neck scarf. I threw on a pair of black classic sunglasses and grabbed my black tote bag and set off for my first day of classes. what a chic and sassy outfit. i love it!